Rene Magritte was the greatest artist of the 20th century. Every artist who worked after him took a bit of Magritte. Therefore, only an apple stump left. "René François Ghislain Magritte (21 November 1898 – 15 August 1967) was a Belgian surrealist artist. He became well known for creating a number of witty and thought-provoking images. Often depicting ordinary objects in an unusual context, his work is known for challenging observers' preconditioned perceptions of reality. His imagery has influenced pop, minimalist and conceptual art. 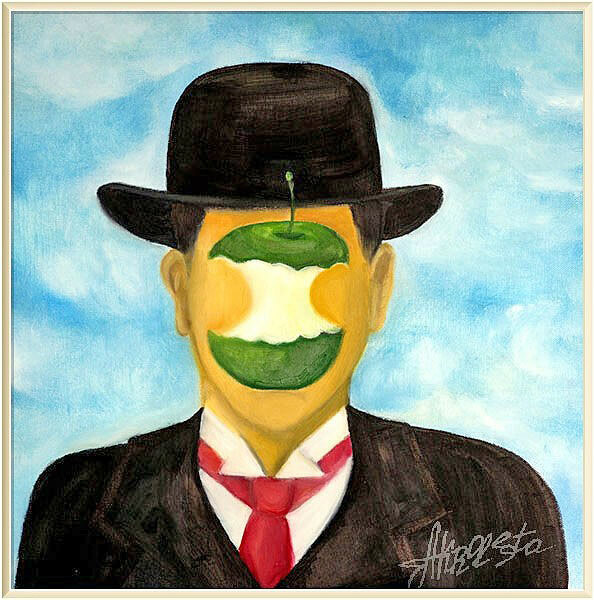 The Son of Man (French: Le fils de l'homme) is a 1964 painting by the Belgian surrealist painter René Magritte. It is perhaps his most well-known artwork. Magritte painted it as a self-portrait. The painting consists of a man in an overcoat and a bowler hat standing in front of a low wall, beyond which is the sea and a cloudy sky. The man's face is largely obscured by a hovering green apple.